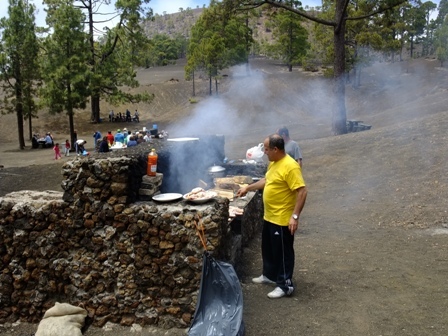 I’ve spent the past few days planning a family and friends BBQ for tomorrow in one of the BBQ/picknic parks up Teide. The dive centre is closed for the day (wow a day off). I have 15kg of chicken legs thawing in my fridge! Plus there’s a good supply of beer in several friends fridge! I was rather horrified this morning when the cabildo announced that they were banning fires and bonfires in the woods and hills due to the heat wave expected this weekend and the ban will not be lifted until the weather cools down. Panic what do I do with 15kg of thawed out chicken legs??? From tomorrow, July 10th and until further notice certain parts of the middle and higher ground on the island of Tenerife will be on orange alert due to a heat wave following the weather forecast issued yesterday by the Spanish Met Office. The temperature is expected to hit 37 degrees centigrade this weekend, and has prompted an official ban on lighting of fires of any kind in recreation and BBQ areas. The Cabildo has confirmed that the ban will not be officially lifted until the weather cools down and the risk of forest and wild fires is reduced. Some parts of Tenerife will be on orange alert tomorrow, which means significant risk. The affected areas will be the mountains and the lower hills in the south, east and west of Tenerife from 11.00 until 21.00 tomorrow, Saturday 10 July 2010, mainly those which are south and west facing because they received less draught from the cooler north westerly winds. All visitors and residents on the island are strongly urged NOT to go up into the hills and woods over the next few days until the situation improves. The Island Corporation kindly request that drivers use only the tarmacked roads and avoid forest tracks whenever possible. Holidaymakers and residents are strongly recommended to take extra precautions when visiting the mountains. In an emergency please call 112. Our BBQ has been saved, thanks to Fred and Glynis, we are moving our venue to lower down the mountain where it will be a bit cooler at Tajinaste restaurant. We will just have to plan the mountain BBQ for another day.